Photo by Nicole Helget. Look at all the clutter on the countertop! And Anderson Cooper on the TV! I don’t do well working in pure silence; I usually need some type of quiet background noise. I find this quote attributed most often to Albert Einstein. My home space is cluttered, and my mind definitely feels the same. 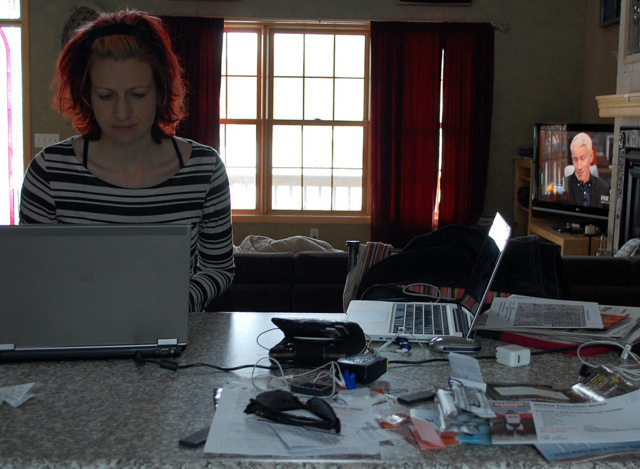 I allowed writer and photographer Nicole Helget to enter my space to document this place where my writing gets done. I’ve long passed the phase where I feel compelled to do a mad cleaning frenzy before people come over. I live here and I work here–it’s ridiculous to think I would live and work in a pristine space. My house is cluttered and I make no apologies. Do you have an office workspace? How does that look? Now imagine you have to bring your office workspace home. Multiply that by two or three (since I’m always working on a few different things on top of my full-time job). You get the picture. If you come over, I will guarantee you that the kitchen and bathrooms will be clean–that’s important to me. But if some bills are lying around, or books, or magazines, or newspapers, then forgive me. Shove the clutter aside and please, sit down and relax. Nicole did a fantastic job with the photos and also the nice things she says about my book. I was honored that she blurbed it, and you can read her take on the book on the back cover. Nicole is an uber-talented writer. She released her memoir, Summer of Ordinary Ways, in 2006 to much critical acclaim. Her story of growing up in rural Sleepy Eye, Minnesota, was a story I turned to frequently as I was writing my memoir. Summer of Ordinary Ways is lyrical, beautiful, and haunting. She also doesn’t do too shabby when writing fiction: See The Turtle Catcher and Horse Camp, a delightful middle-grade novel she wrote with her husband, Nate LeBoutillier. She regularly blogs, posting intriguing and artistic photos of daily Midwestern life. She captures the extraordinary and the beauty of people, landscapes, and life in general that we often overlook. Do yourself a favor and put her blog in your feed. Rachael, I am enjoying your book very much. I remember reading about some of the Waseca historical events you write about in other accounts, but your writing style gives each one so much more meaning. Congratulations, and wouldn’t your dad be proud of you. Thank you so much for the kind words, Sheila! I’m glad you’re enjoying the book. I don’t have piles of clutter. I have skyscrapers. I don’t have dust bunnies. I have dust wolves. Sometimes I hate it and am embarrassed when people come over. Most of the time, I don’t have the time to care. Unlike you, however, I need pure silence to do my best writing. (This drives my twin teens crazy.) My favorite place to write is on early summer mornings on my front stoop, tea next to me, as I listen to my neighborhood wake up. I have become a lot more relaxed regarding the clutter. If it works for me, that’s all that’s important! I would think pure silence is hard to come by in your house!